At a recent scientific meeting, Carlos Zarate of the National Institute of Mental Health (NIMH) discussed a variety of rapid-onset antidepressant manipulations. The talk focused on intravenous (IV) administration of the NMDA receptor antagonist ketamine and the anticholinergic drug scopolamine. 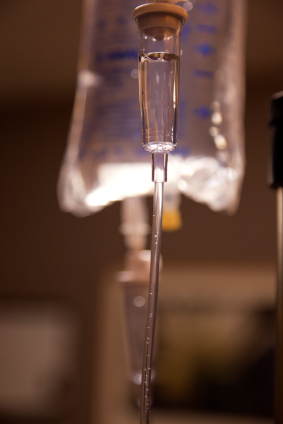 Intravenous ketamine has been administered to approximately 1000 patients at research centers at Mount Sinai Hospital in New York, Yale University, and at the NIMH in Bethesda. The results have been consistent; more than half of the patients experienced a rapid onset of antidepressant effect, usually within the first 2 hours. However, the effects of intravenous ketamine tend to disappear after 3 to 5 days. In both unipolar and bipolar depressed patients whose illness has been highly resistant to multiple treatments, ketamine also brings about a rapid-onset decrease in suicidal ideation and intent. In some cases these positive effects have lasted a week or more. Thus intravenous ketamine could potentially be used at hospitals to treat suicidal emergencies. New data indicate that intravenous scopolamine, a selective blocker of muscarinic cholinergic receptors that is used to help ward off seasickness, brings about onset of antidepressant effects in up to one day and sometimes in a matter of hours. As with ketamine, these effects occur in both unipolar and bipolar depressed patients. Editor’s Note: New data from animal studies may be able to explain some of the mechanisms behind the rapid onset of antidepressant effects that occurs with ketamine. Ketamine causes increases in brain-derived neurotrophic factor (BDNF), which is important for the development and health of neurons. In rodents, new synaptic proteins are created following intravenous administration of ketamine. If animals are subjected to chronic unpredictable stress, dendritic spines (on which synapses are formed) appear to shrink. However, when ketamine is administered intravenously to these animals, not only is their behavior rapidly ameliorated, but the thin dendritic spines shift back to their more mature, mushroomed-shaped form within a few hours. (A slightly slower, less dramatic change in spines occurs with scopolamine.) A loss of dendritic volume has also been demonstrated in depressed people. The data in animals are not only valuable for their potential application in clinical treatment and emergency situations involving suicidal ideation, but they also demonstrate a mechanism by which a single administration of intravenous ketamine or scopolamine is capable not only of reversing depressive behaviors in animals, but changing dendritic spine morphology. Given this development, it may be possible to identify other treatments that induce rapid-onset antidepressant effects using other parts of the same neurological pathways. Intravenous thyrotropin releasing hormone (TRH) also has rapid-onset antidepressant effects within 24 hours in depressed patients, but tolerance develops after repeated use. Surprisingly, one night of complete sleep deprivation can also bring about dramatic onset of antidepressant effects the following day in approximately 50% of severely depressed patients. In animal studies by Ron Duman and colleagues at Yale University, administration of brain-derived neurotrophic factor (BDNF) either into a rodent’s blood or its brain has induced rapid-onset antidepressant-like effects. Taken together, these data indicate that there are ways to bring about rapid improvement in depression, even if conventional antidepressants usually require 2 to 4 weeks to exert their maximum antidepressant effects. The question now is how to sustain these antidepressant effects in the longer term. In a study at Mt. Sinai Hospital in New York, ketamine was administered in five intermittent doses over 10 days to two weeks, and the antidepressant effects were sustained during that period. The repeated doses of ketamine were well tolerated in the study. However, the safety of repeated ketamine administrations has not been systematically assessed. Researchers are currently investigating whether other treatments that are currently available could be successful in sustaining the initial positive effects achieved on ketamine. The dramatic rapid-onset antidepressant effects achieved with ketamine and scopolamine as well as other drugs currently in development provide a new perspective on the debate in some media circles about the effectiveness of antidepressants. Because depression sometimes spontaneously improves, placebo effects in studies of antidepressants for acute depression treatment can be large. This has led to some controversy over the magnitude of effect of antidepressants over placebo, especially in those with milder forms of depression. The placebo-controlled rapid onset data reported here indirectly refute the argument that all antidepressants are not much more effective than placebo for acute treatment of depression. Moreover, they show that both biochemical and structural changes in the brain and behavioral improvement can in some instances be achieved in just a few hours if appropriate mechanisms (NMDA receptor blockades) are engaged. Critics of antidepressants also typically fail to mention the most important data about antidepressants for patients with recurrent depression: the drugs’ preventative effects. All treatment guidelines of which this author is aware recommend that patients with two or three prior episodes of depression continue long-term prophylactic treatment after a good antidepressant effect is achieved. Continuation of an active antidepressant (compared to changing to placebo) brings about an approximate 70% reduction in depressive recurrences. In March 2012, the CBS news program 60 Minutes was the latest to gloss over the benefits of antidepressants, discussing the placebo effects in the acute antidepressant studies while leaving out the drugs’ unequivocal efficacy in long term prevention. It is hard to imagine a media campaign against useful drugs to treat other forms of illness, such as cancer or heart disease. Oversights like these are all the more egregious in light of World Health Organization data that depression is one of the top causes of disability worldwide and causes or exacerbates many other medical illnesses. As we wrote in “5 Myths About Antidepressants” in BNN Volume 14, Issue 3 from 2010, it is crucial that patients learn about the overwhelming efficacy of antidepressants in long-term prevention, particularly because recurrent depression carries many adverse outcomes beyond the considerable pain and suffering with which it is associated. Some risks are cognitive. Data suggest that cognitive dysfunction increases with the number of previous depressive episodes, and a diagnosis of dementia in old age is twice as likely to occur if one has experienced four or more episodes of unipolar or bipolar depression. In addition, depression is a risk factor for many medical illnesses and comorbidities. For example, a depressed person is twice as likely to have a heart attack than a person who is not depressed, and is twice as likely to die of a heart attack compared to someone who is not depressed who has a heart attack. Most medical illnesses are vastly more difficult to treat in depressed people as well. Life expectancy is lowered dramatically in patients with major psychiatric illness (including bipolar disorder, unipolar depression, schizophrenia, and ADHD). There is good news. All antidepressants appear to increase neuroprotective factors (such as BDNF) and neurogenesis (the creation of new neurons that continues, at least in rodents, through adulthood). Being on antidepressants more of the time has been shown to prevent decreases in volume of the hippocampus with aging in those with unipolar depression. For those with bipolar disorder, most mood stabilizers also increase BDNF. Lithium increases hippocampal and cortical gray matter volume in humans. New data suggest that lithium may have neuroprotective effects even at low doses, and data from a large study in Denmark suggest that chronic lithium treatment may decrease the incidence of a diagnosis of dementia.